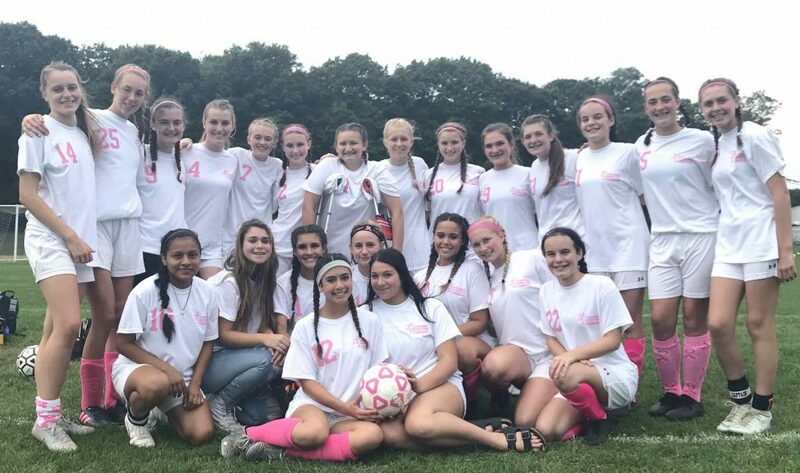 The Port Jefferson School District’s girls varsity soccer team held their annual Pink Game in support of Kicks for Cancer, a local initiative that combines athletics with fundraising for cancer research. With a bake sale and gift cards and high-end raffle prizes the girls raised more than $1,000 to support the cause in a winning game against Amityville. Along with coach Taylor Forstell, the school community congratulates team members Francesca Antonelli, Heidi Biedenkapp, Paige Bruno, Morgan Bullis, Alexandra Carlson, Kate Carlson, Holly D’Accordo, Kailey D’Accordo, Madison Feinstein, Hailey Hearney, Kerrigan Hurney, Farrell Johnston, Sophia Knapp, Reese Koban, Jacqueline Lambe, Gina Lucero, Beverly Ann Maier, Lena McFarland and Abigail Rolfe on this outstanding achievement. “We are so proud of the efforts of our athletes to not only play the game but understand how to help make a difference in the lives of others,” said Port Jefferson School District’s Director of Health, Physical Education and Athletics Adam Sherrard. Photo caption: Port Jefferson School District’s girls varsity soccer celebrated their fundraising achievement.